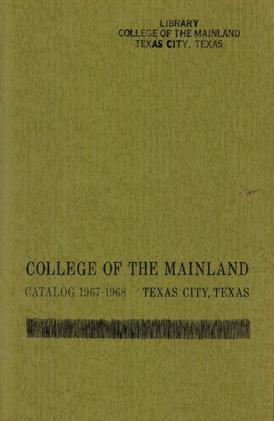 Access College of the Mainland catalogs. All past COM catalogs are available online. In addition to use for academic purposes, the catalogs can be used to learn about the history of the College. Access catalogs from the 1960's, 1970's & 1980's or from the 1990's, 2000's & 2010's. Most COM Catalogs were published in print and were digitized. The best copies available were used, but condition varies. In order to make them readable, the files were scanned at high quality and may be slow to load--they tend to load more quickly when using Chrome. All catalogs are searchable by using the CTRL F function in your adobe reader. College of the Mainland is a comprehensive two-year public institution which offers a variety of courses, programs and services. As a result of the work of a steering committee composed of interested citizens of Galveston County, a union junior college was first created January 16, 1965 under the name of Galveston County Union Junior College District. In October of 1966, the name of the Union District was changed from Galveston County Union Junior College District to College of the Mainland, and on December 10, 1966, voters of the district approved a bond issue of $2,850,000, and a maintenance tax rate not to exceed 30@ on the $100 valuation. The purpose of College of the Mainland is to increase post high school educational opportunities in the mainland area of Galveston County. Its programs will include two-year college parallel and technical programs, one-year vocational programs, a variety of educational programs for adults, and guidance services for in-school and out-of-school citizens. The college, while helping the student to develop the understandings, dispositions, and habits required for living effectively in an open democratic society, seeks also to prepare students for successful entry into the upper division of senior colleges and universities or for entry, immediately upon graduation, into an occupation. Temporary offices were opened in January 1967, in the Bank of the Mainland Building, La Marque; and on March 18, 1967, the Board of Trustees selected Dr. Herbert F. Stallworth to serve as the first president of the College. On June L, 1967, the college offices were moved to a building on the Booker T. Washington School Campus at 721 2nd Avenue South in Texas City. Arrangements have been made to lease buildings located on the Booker T. Washington Campus at 72L 2nd Avenue South, Texas City, from the Texas City Independent School District for temporary classrooms for College of the Mainland. The college will remain in the temporary facilities until the new campus is ready to be occupied, which is estimated to be on or before September, 1969. Selection of a location for permanent buildings has been made by the Board of, Trustees on the south side of FM 1764 approximately one mile west of Galveston County Memorial Hospital. The site, which includes 120 acres, has been purchased and will be developed in accordance with a master plan.